The dean of Indiana University’s School of Informatics and Computing, Raj Acharya, will give the keynote address at the Bloomington Economic Development Corp.’s annual meeting set for 11:30 a.m. Wednesday at the Bloomington/Monroe County Convention Center. 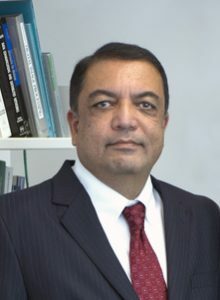 Along with his duties as dean, Acharya is the James H. Rudy Professor of Engineering, Computer Science and Informatics for the school. He arrived at IU in July 2016 from Penn State University, where he was founding director of its School of Electrical Engineering and Computer Science — and headed the Departments of Computer Science and Engineering (within the School of Electrical Engineering and Computer Science) for 14 years. He also held an appointment at Penn State’s Applied Research Laboratory for conducting classified research. He was previously a Research Scientist at General Electric (Thomson) CSF Laboratory, Paris, France, and has been a Research Fellow at various NASA and DoD labs. He is on the board of Videomining and Technology Collaborative — a technology-based economic development organization.